Jenna Coleman and Meghan Markle in Emilia Wickstead dress . I saw this dress again today in German "Stern" - dubbed as the "dress of the year". Because it was worn so often by so many different women. 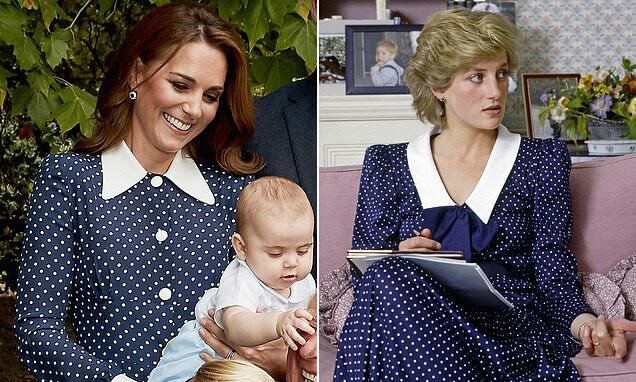 The Duchess of Cambridge and British singer Pixie Lott appear to have very similar taste when it comes to fashion! 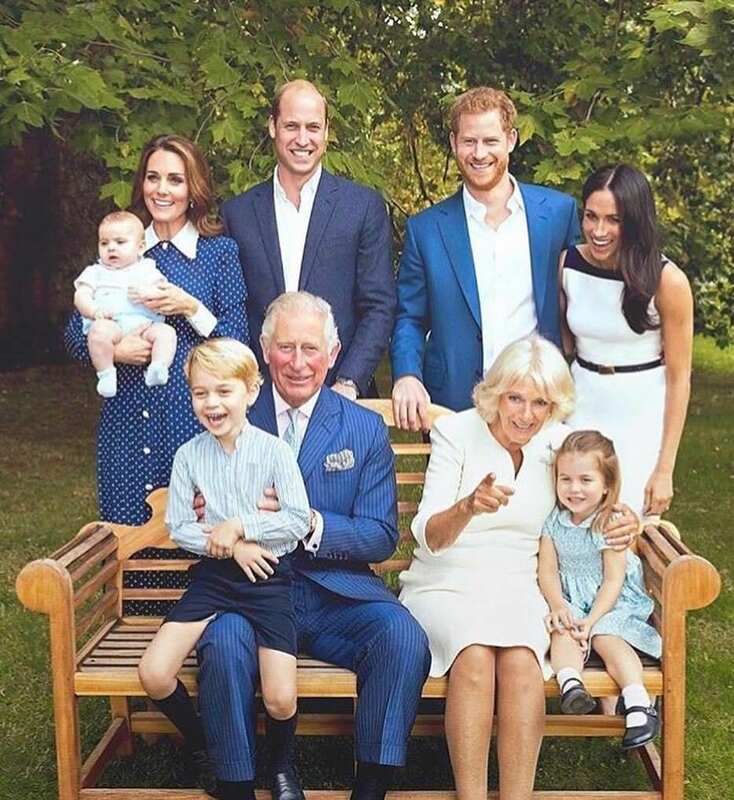 On October 10, Kate made her first appearance since the news of her third pregnancy was announced wearing a gorgeous blue lace dress from Temperley. If you thought that the design looked familiar, you would be correct. A month earlier, Pixie wore a minidress version of the iris lace design to Temperley's London Fashion Week show. Kate and Crown Princess Mary of Denmark were twinning in pastels. The Duchess of Cambridge wore this lavender dress by Emilia Wickstead during her five-day royal tour of Germany and Poland in July 2017. Meanwhile the Danish royal stepped out wearing a power blue version of the dress during a 2015 trip to Tokyo. Spain's Princess Leonor and Infanta Sofia stepped out for their country's National Day celebration on October 12, 2016 sporting Carolina Herrera coats very similar to the one worn by the Duchess of Cambridge during her 2016 royal tour of Canada. Like Kate, Sofia opted for a scarlet coat by the designer, while her older sister Leonor wore a darker shade. Princess Claire of Luxembourg and the Duchess exuded femininity wearing the same pale grey dress by Beulah London nearly five years apart. Kate wore the bespoke piece in Malaysia during her 2012 Diamond Jubilee Tour of the Far East, while Claire wore the sophisticated frock in May 2017 for the Octave closing ceremony. The Duchess of Cambridge had Vogue's seal of approval on her 2017 BAFTA gown. 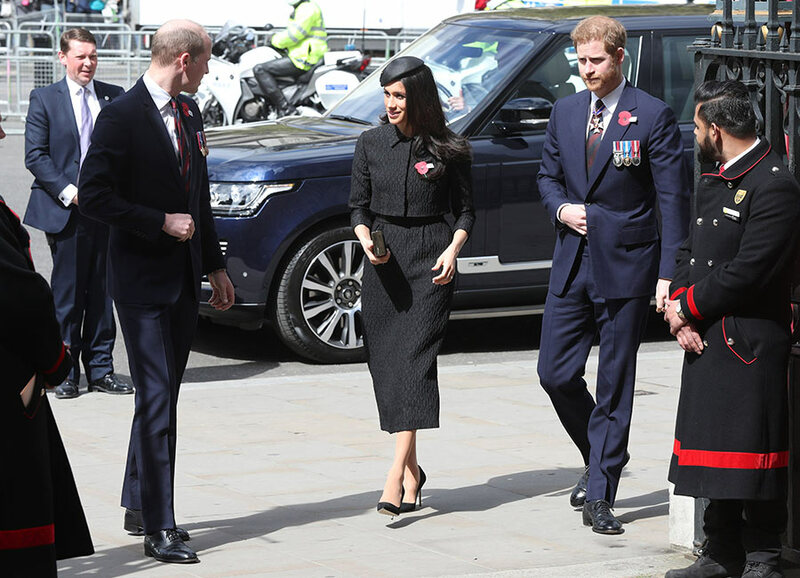 The royal wowed stepping out in a full-length, off the shoulder version of an Alexander McQueen gown that Anna Wintour's daughter, Bee Shaffer, had worn in 2015. The daughter of American Vogue's editor-in-chief opted for a spaghetti strap version of the floral corset dress for the 8th annual Museum of Modern Art Film Benefit in New York City. 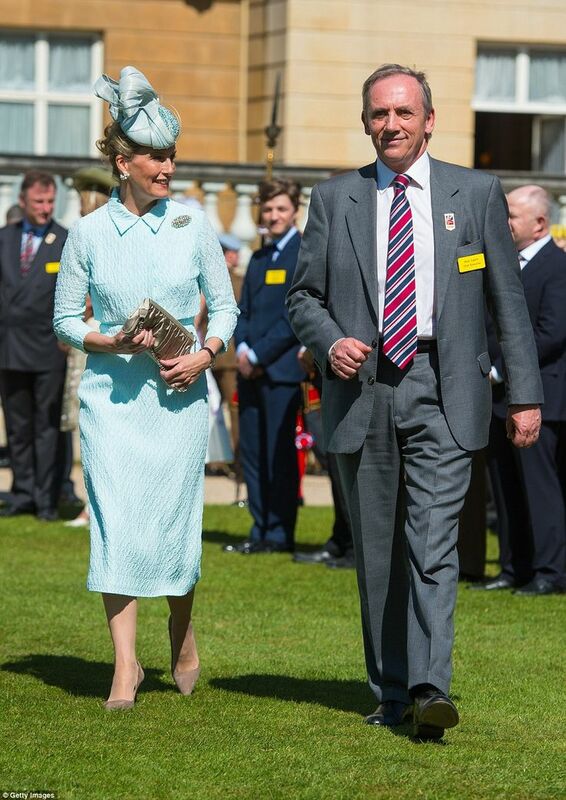 A frock fit for future Queens! Months before the Duchess of Cambridge had her Cinderella moment wearing shimmering Oscar de la Renta pumps and her Erdem Rhona dress to the launch of the UK-India Year of Culture 2017, Crown Princess Mette-Marit of Norway stepped out wearing the same pleated, elegant Dress to the Canadian Museum of History in Quebec. Kate Middleton got festive stepping out in a frock previously worn by actress Drew Barrymore. The stylish royal attended the 2016 Heads Together Christmas party wearing the Cai Floral-Print Jacquard Dress by Vanessa Seward, which she paired with a Mulberry clutch and black suede Gianvito Rossi pumps.The Hollywood star wore the silk dress a few months prior to the Duchess. Like Kate, Drew accessorized the knee-length design with a black handbag and matching ankle strap heels during her 2016 “branding trip” to Hong Kong. Kate Middleton got festive stepping out in a frock previously worn by actress Drew Barrymore. The stylish royal attended the 2016 Heads Together Christmas party wearing the Cai Floral-Print Jacquard Dress by Vanessa Seward, which she paired with a Mulberry clutch and black suede Gianvito Rossi pumps.The Hollywood star wore the silk dress a few months prior to the Duchess. Like Kate, Drew accessorized the knee-length design with a black handbag and matching ankle strap heels during her 2016 "branding trip" to Hong Kong. Prince George's mom and Angelina Jolie looked like Grecian goddesses donning one-shoulder dress by Jenny Packham. Kate wowed wearing a silver version of the gown to a 2011 reception and dinner at St. James's Palace, while Angelina wore it in a scarlet color months prior to the Los Angeles premiere of The Tree of Life . Weeks after Kate Middleton wowed in an off-the-shoulder midi dress by Barbara Casasola for the Art Fund Museum of the Year Award held at the Natural History Museum, Melanie Griffith donned the same dress in a darker shade across the pond for a Hallmark Channel TCA event. While Kate wore her glossy locks down with the frock, the Hollywood actress opted for an elegant updo. The royal and her infamous "effect" also inspired reality star Kourtney Kardashian to wear the on-trend dress for her You magazine photoshoot. Kate and Amal Clooney not only have beauty and brains in common, but also a similar taste in style. 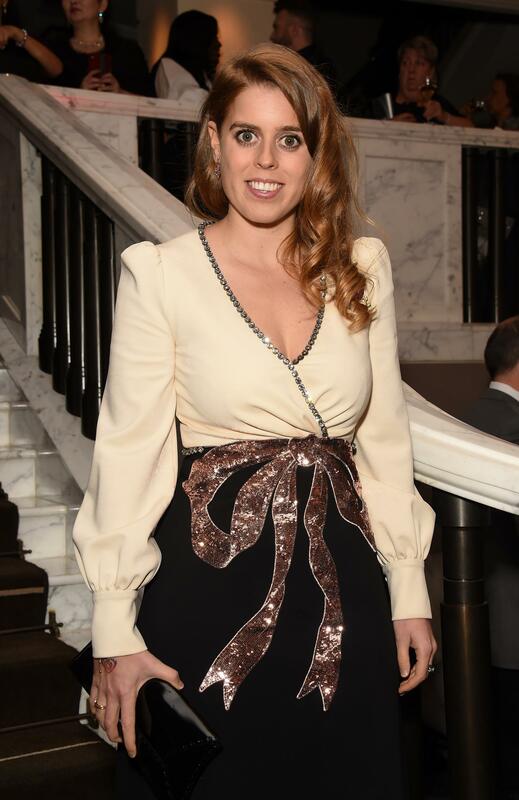 The human rights attorney stepped out to the United Nations in 2016 wearing an Alexander McQueen dress featuring the label's "Obsession Multi Print." Kate wore the same floral and butterfly pattern in a different dress style earlier in the year during the Wimbledon Men's Finals. Apart from being in relationships with British royals, the Duchess of Cambridge and actress Meghan Markle also share a similar sense of style. The two ladies both donned lacy Diane von Furstenberg dresses a few years apart. Prince Harry's American girlfriend donned a shorter navy version of the designer's "Zarita" dress to a 2012 USA Network event in Hollywood, while Prince William's wife opted for a full-length black gown version for the 2014 Royal Variety Performance in London. Kate Middleton wowed in an elegant white crepe gown by Self-Portrait at movie premiere in London on November 3. The Duchess of Cambridge's stylish outing comes a week after heiress Paris Hilton stepped out in Los Angeles wearing the same Victorian-inspired, pleated maxi dress To amfAR's Inspiration Gala. Unlike Kate who wore her glossy locks down in loose waves, Nicky Hilton's sister opted for an updo to show off the crochet necklace. Mandy Moore took a page out of Kate Middleton's style book wearing a royal blue version of the Duchess' Preen dress to a This Is Us screening and panel held at Los Angeles' The Cinerama Dome on June 7, 2017. Prince Willliam's wife first wore the off-the-shoulder number during her 2016 royal tour of Canada. Ladies in red. The British royal and Emmy Rossum wore the same red. Dressed in a span of a couple of days. Kate donned the dress with the asymmetrical neckline to a reception held at Victoria's Government House during her 2016 royal tour of Canada. Meanwhile the Shameless actress wore the tea-length frock to her bridal shower luncheon at the Bel Air Hotel. Good one Kaiserin , and the resemblance is remarkable if I may say so. Meghan markle and Carolyn Bessette Kennedy. Oh, the Kennedy couple! They are still stylish 20 years later. Unluckily they haven't aged, and neither have their photos.